Hello Car Junky, your advice would be greatly appreciated! '08 Dodge Avenger 2.4 SE, 106,640 miles. Check engine light appeared, vehicle was running okay, save for some stuttering when accelerating while already at freeway speeds. I ran codes, only p2017 came up. I sprayed carb cleaner in my intake and it ran better with less stuttering though it didn't clear the code. I simply replaced the Runner Control Valve, cleared code, drove 35 miles, and the light re-appeared. I drove another 40 miles and ran the codes again, found nothing but p2008. p2017 is gone but I'm not certain I've driven enough to cycle any/all other systems. Before mounting the new Runner Control Valve I attempted to turn the post that's attached to the intake flappers. The post went less than 1/32 of a turn before resistance; I didn't want to push it so I left it alone. When mounting the valve, instead of being able to position the flapper post, I had to rotate the valve off center, slide the valve post in to the groove of the flapper post, then rotate the valve back a very short distance to align with the bolts. Is that normal? Couple side notes: I noticed my air filter was incredibly dirty. Also before mounting the Valve I sprayed both WD-40 & carb cleaner at the flapper post, not sure why, just thought it was necessary. In doing so I may have gotten a small amount of each product on the harness connecter. Everything was dry before I connected anything, but I fear the spray could have damaged the connector. I've checked for lose or damaged wires and hoses, couldn't find anything, though I searched without any testers. Could it be as simple as cleaning the harness connector? Do you have a scan tool that can read the MFV feedback percentage? Does this vehicle use the GPEC or the NGS engine controller? I really wouldn't use carb or WD40 in those electrical connectors. Electrical contact cleaner would be best. Not sure on the range of travel for the valve itself, but it should rotate more than 1/32. 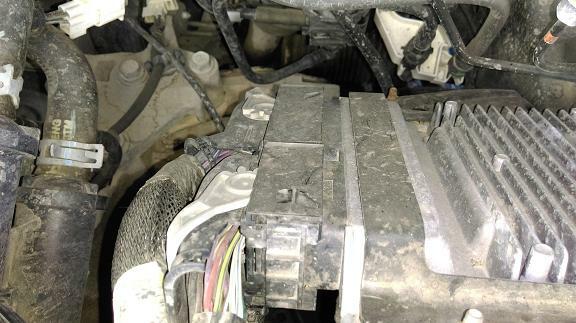 You might need to remove the intake manifold and see what is going on with the flappers. Thank you for the quick reply Discrete. Unfortunately no scan tool, I've been taking the car to the parts store for the scans and clears. Should I ask them to look for something specific? Also I'm not sure about the type of controller, how can I tell? I haven't intentionally used those sprays on the connectors, they just may have ricocheted off the flapper post and splashed on to the connector a bit. I'll remove the new Valve and check to see how much I can turn the flapper rod now. I've seen a bunch of forums with regard to p2004 and having to remove the manifold and clean the flappers; was hoping p2008 was less of a headache. Most of your parts stores are not going to have the equipment to look at engine data information. Most auto repair shops have the enhanced scanner to see that kind of information. The NGC controller has 4 connectors that use tabs to secure the connectors to the controller. The GPEC controller uses sliding bars to lock the connectors to the controller. The P2008 code has to do with the PCM detecting improper voltage on the manifold flow control circuit. That circuit (brown/violet) is used by the PCM to control the actuator that rotates the valve. Funny that code shows up after you replaced the actuator. Does that code reappear after it is cleared? You can check the voltage on that circuit using a volt meter. Back probe the actuator connector on the brown/violet wire with your meter grounded to the battery negative. You really need a scan tool that has bidirectional control to activate the actuator for this. You also have to understand that because the P2008 is showing up, that might disable the manifold runner control system, so you won't see the previous codes you had gotten show up. I haven't had the code cleared since getting the p2008. Do you think clearing it could make the system work? Removed the valve and the flapper rod still only rotates a very small amount. I'd say it was an insignificant amount though I started the motor and turned the post, it still moves the same amount as when the motor is off, though I heard a slight change in the idle when rotating. It's less of a rotation and more of a loose wiggle. I hooked up the electrical to the valve and turn the motor over, the valve post doesn't move or actuate at all. I purchased it new from Oreilly, is it possible I just need the dealer part? What you're saying makes total sense. I own a voltmeter though unfortunately I'm not familiar with it. I can have a friend come over to use the meter. Or would the process of re-mounting the old Runner Control to see if the 2017 code comes back without p2008 essentially be the same as testing the electrical? Here's a pic, not sure if they're tabs or bars. That is definitely a GPEC controller in your picture. Putting the old actuator back on to see if code P2008 goes away is a good idea. Still not too sure about the travel on that flapper set up, but 1/32 isn't very much at all. Really too bad you don't have access to a scan tool that can command that actuator to move while you watch its travel. About the only things you can do is some circuit checks using your volt meter to make sure that the actuator has everything it needs. Got an inexpensive scanner, ran codes, 2008 was there, as well as 2017. So I cleared the codes and I didn't get 4 miles before 2008 popped up. Cleared, repeated driving with same results. Re-mounted the old valve and no codes have come up after 70 miles. Before installing I'd sprayed a generous amount of carb cleaner and wd-40 at the valve's rod. Hopefully it's fixed, though if the 2017 code comes back I'll look in to a dealer valve first. If I don't post again*, all is well, and thank you for your help!